The displayed fares were last found on: Wed | 17 April 01:32 AM(EST) . Fares are round trip. The displayed flight tickets to Tegucigalpa, Honduras are round-trip. The fares against flights to Tegucigalpa are based on historical data, non-warranted, and are subject to change. To know the best airfare deals to Tegucigalpa, perform a new flight search using the flight booking engine provided on the top. Plan your Tegucigalpa travel with Cheapfaremart, an Orlando-based travel company recognized by the American Society of Travel Agents (ASTA). Compare one way or round trip flights to Tegucigalpa with different carriers before you confirm flight booking. We allow travelers to book cheap flights with over 200 airlines associated with ARC. Use filter options – nonstop, one-stop or two-stop available with our flight booking engine – for better comparison. In case of connecting flight, make sure to have the shortest layover duration while you book cheap air tickets to Tegucigalpa. What is the Best Time to Visit Tegucigalpa? The best time to visit Tegucigalpa is between December and March. The place receives around 7 hours of sunshine per day, and there is little or no rain. Dry weather and plenty of sunshine make it easy for a visitor to explore the place. Fortunately, the best times coincides with a series of festivities including Black Friday, Cyber Monday, Christmas, New Year, Valentine Day, Mardi Gras, etc. So, make the best of your vacation. You are likely to get flight discounts on these special occasions. 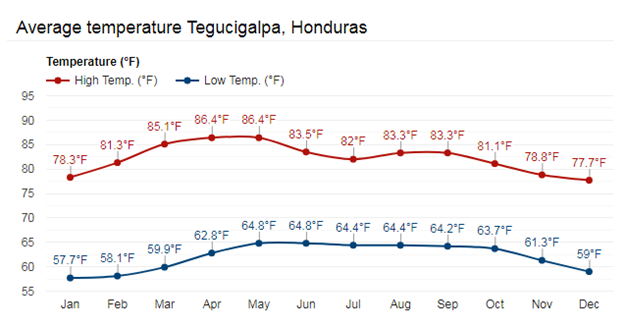 However, the comfortable weather triggers the demand for Tegucigalpa flight deals. Book your tickets in advance. Resorting on last-minute flights to Tegucigalpa means you end up paying more. What Things to Do in Tegucigalpa Honduras? The Christ at “El Picacho” is a monument standing on the hill El Picacho in the north area of Tegucigalpa. The sculpture weighs 2,500 tons and stands 98 feet in total height. Its location, height, and illumination complement to its popularity. It’s visible from most of the areas of the Central District. For some adrenaline rushing outdoor experience, what would be a better option than soaring the tropical vegetation via a zip line? The tropical forest areas in Tegucigalpa and Roatan have got many zip line operators. The trip duration could be between 60 and 90 minutes. Since there is a high demand for zip line experience, consider making a booking with the operator. A visit to Honduras is incomplete without scuba diving, fishing, snorkeling, and parasailing. This picturesque destination has got everything that you might have envisioned in your things to do in Tegucigalpa list. The city is served by Toncontín International Airport (TGU), which is located 6 km (4 mi) from the center of Tegucigalpa. It serves civilian and military both. The top airlines that depart or arrive here are United Airlines, Delta Air Lines, Copa Airlines, American Airlines, and Aerolíneas Sosa. If you are traveling from the US, connecting flights are available only. The popular stopovers are Panama City (PTY) and Dallas (DFW). How Much Does a Flight to Tegucigalpa Cost? Some fares for flights to Tegucigalpa Honduras are shown on this page for your reference. The fares are inclusive of base fare, fuel surcharges, and airline/airport taxes. However, the flight tickets as you understand are dynamic – depending on supply and demand. To know the current fares for plane tickets to Tegucigalpa, use our flight booking engine. Why Book Airline Tickets to Tegucigalpa with Cheapfaremart? Search, compare and book your cheap air tickets to Tegucigalpa. For help regarding finding the best flight routes and reserve your flight, call us on 1-844-869-5222 (Toll-Free).